Scratch building or a conversion? There are models that need so many changes that building entirely new from scratch would take less time than converting an existing model. 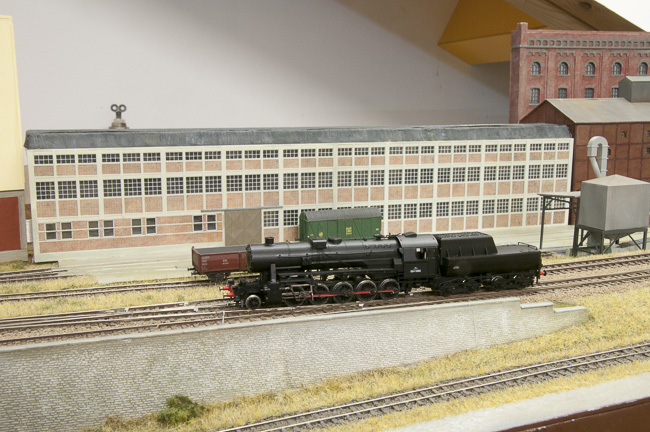 The NMBS type 25 and 26 belong to the category that a conversion is a half way house to an entire scratch built. In such a case a 'model' can only be used as a helpful parts supplier. In the case of a type 25 it would be possible to built one correct loco using parts from 3 different models, which would make a conversion a costly business. Therefore producing the failing parts by scratchbuilding helps to keep the costs in control. 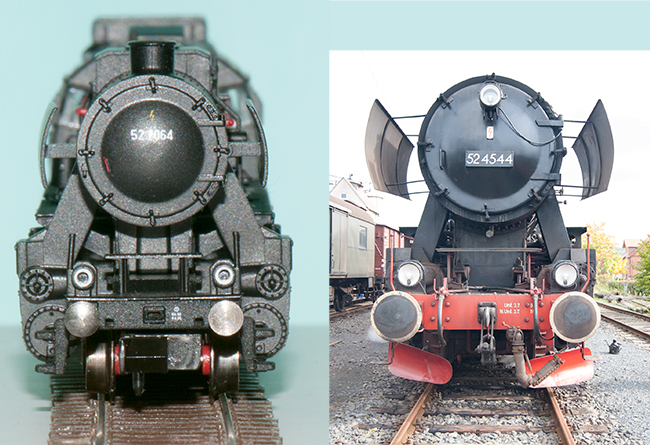 For creating a type 25 or 26 NMBS loco your best option is to use a FLM Br52 as donor model. 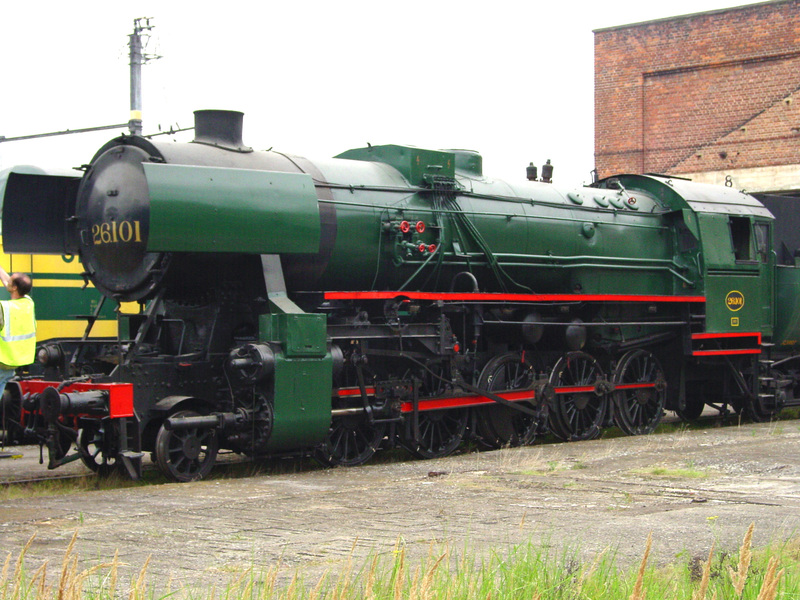 None of the loco's built in Belgium was preserved in original form. The historical conscience of the NMBS/SNCB is at an exceptionally low level compared to other (railway) companies in general, surviving steam loco's are more accidental than by purpose. However there are several preservation railways doing their best to repair this but for steam these came too late and too few. The PFT/TSP operates a Br52 camouflaged as type 26.101, this is of course a 1:1 farce: frame, cab and tender front are completely off and have nothing to do with any of the Belgian built locomotives. This connection is completely besides the truth, the NMBS specifically ordered the same open cab as on the Br 50 requiring a back wall with windows on the tender. This allowed to switch between the 2 different types of tender at wish at revisions. 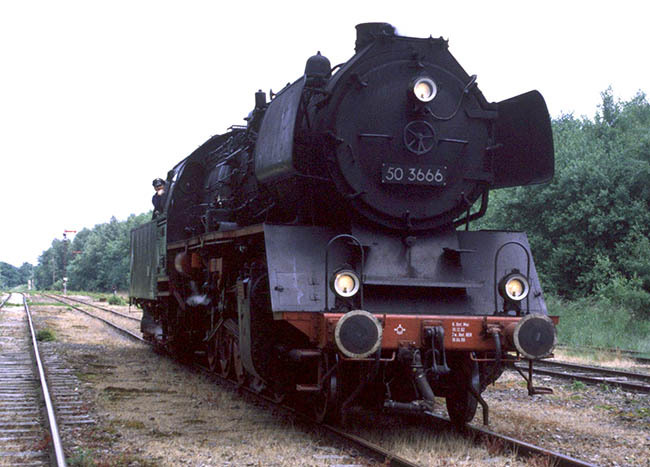 An original AFB built BR 50, but enhanced by a total rebuilt by the former DR, East German State Railways, here seen in service on the Vennbahn. From this viewpoint the model doesn't look like the real thing at all! The width over the cylinders can be reduced with 4 mm without causing any problem with curves in fs160. Reducing this width automatically allows to correct the angle and narrowing the overdimensioned steampipes. 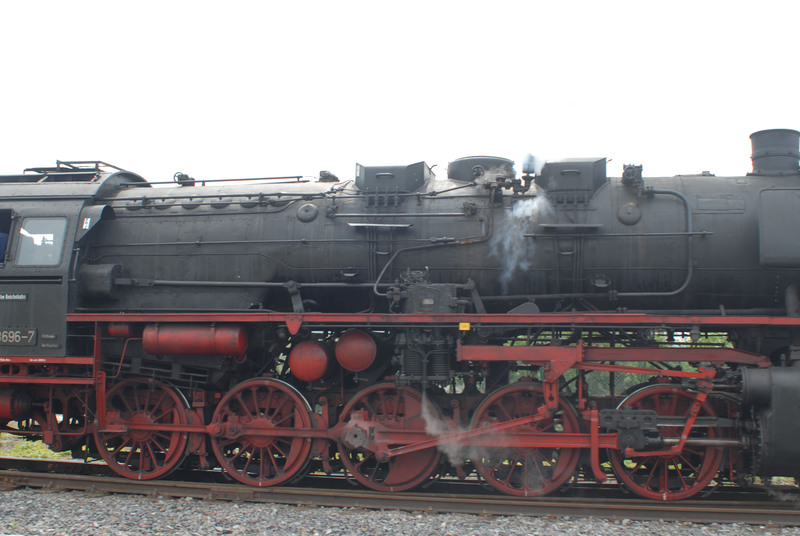 There were a lot of varieties on the German war loco BR 50 ÜK/BR 52. An excellent source of information complete with 1:43 drawings and photos of the migration traject from Br 50 to Br 52 is found in "Kriegslokomotive K52" by Helmut Skasa, 2000, Verlag Resch. For more information on the type 25 consult Phil Dambly's steam bible #2 and search for the booklet "Stoomlocomotief type 25 van de NMBS" produced by S.A. Editions H.K in 1994 which is in itself a reprint of J. Casiers brochure on the type 25 from 1978 printed by the VEBOV, extended with a handful of excellent photos from J.H. Renaud. Sometimes you can find these VEBOV brochures in second hand book stalls, particular the series of VEBOV brochures are must haves to practising modellers of Belgian railways. Several other of the excellent photo's of J.H. Renaud can also be found in 'Vaporeuse Belgique' from 2013 and 'Trains de Belgique Annees 1950' from 2014 from Nicolas collections.com, of course all are out of print. Of course there are many preserved examples thus it cannot do harm to visit some museum lines, but note that these are not all historically justified. Many of the preserved loco's concern modern DR rebuilts thus do your home work first. 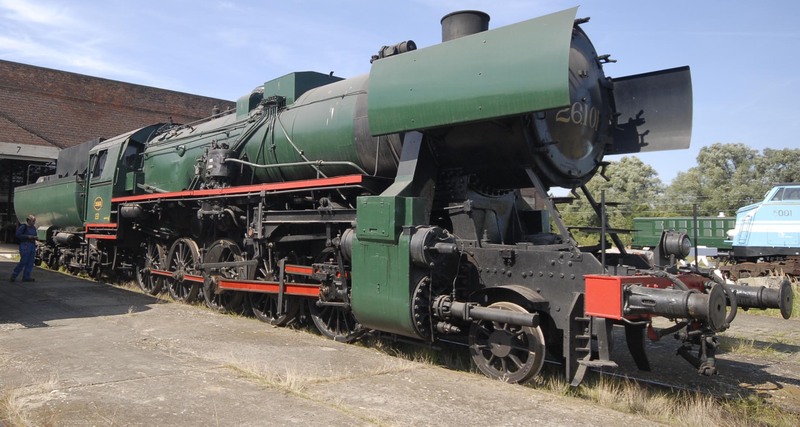 Notably the PFT/TSP 26.101 is not entitled to carry this number as it doesn't have a bar frame like the original Belgian loco's, it was built as Br 52 by Kraus Maffei, this contrary to 50.3666 formerly owned by the Vennbahn which was a real Belgian loco built by AFB, but was upgraded and re-built by DR, this loco is now owned by VSM as 50.0073. Also 50.3696 is a fine example of such a loco. Actually the combination of that AFB built bar frame with the boiler of the PFT loco would form a justified combination for a loco numbered 26.101 after some additional surgery to the back of the cab and tender front and mounting the failing boiler claddings. Exactly this same operation we need to carry out on our R-T-R models. These loco's were coupled to either a 2'2'T26 or 2'2'T32 tender and all the combinations of loco and tenders can be found by photographic evidence. An ideal commercial situation that would allow to produce a loco family of 8 variants however there was only a single model on the market, possibly because N doesn't have many followers in Belgium. Minitrix brought at one time a 'model' of a type 26, but the dimensions of its boiler are grossly over scale and the width over the cylinders is ridiculous, spoiling the look. 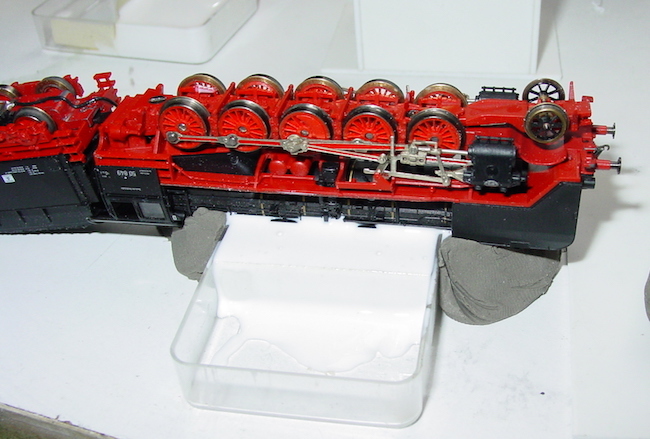 The motor is in cab/firebox and of course the base is a model with sheet frame and closed cab. The Belgian machines didn't have a closed cab, instead the front of the tender carried a windshield and a set of windows. 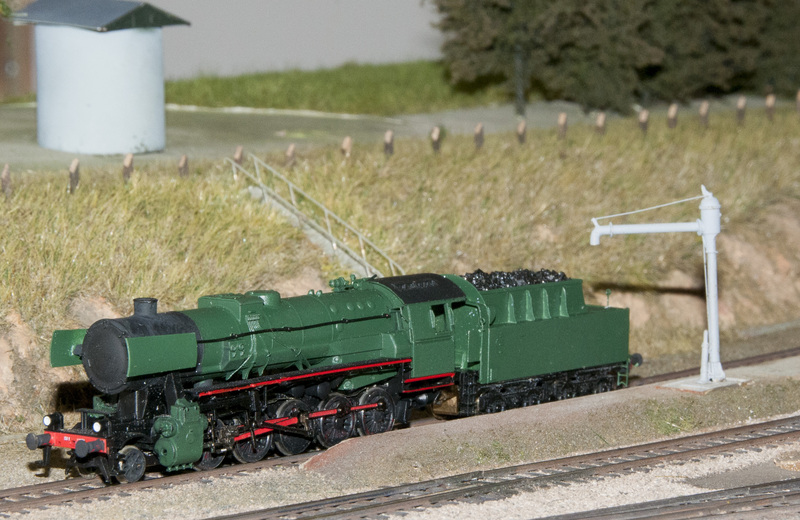 Thus this model (if you can find one) is not a good starting point, not even when you want to have a model of the PFT 26.101, this because of the failing frost protection covers on this german machine, which happen to be about the only items that are correct on the Minitrix machine. The current Fleischmann model of the Br 52 is good to scale except for the width over cylinders of course, but it still concerns a loco with sheet frame and on the left hand side all the frost protection covers are failing, the cab is just as far off as the Minitrix model. The Br 50 model can be used too for a type 25, but this requires cutting up the boiler to remove a dome and the preheater and all the tubing to be scraped off to finish with a nearly bare stripped boiler The air vents in the roof of that cab are fine for a type 26, but then you have to remove all traces of the first side window and of course on a type 26 the windows in the front of the cab were of the rectangular type. Both models are readily available on the market in different variants and all can serve as donor for a better model. This requires to produce a bar frame and depending on whether a type 25 or 26 is constructed a handful of parts of the donor machine can be used with some modifications. The easiest way to draw a new frame is to scan a drawing from the mentioned book and load it into your drawing package. You can than draw a copy on top of it and scale that to model size. Next step is to decide on how to built this in hardware. I used a milling machine but etching is an alternative. It is a complex frame with many openings thus fretting it out by hand using a jewellers saw is quite a task but not impossible. I drew the lot in Corel and used the contour function to generate a pattern for the milling cutter. 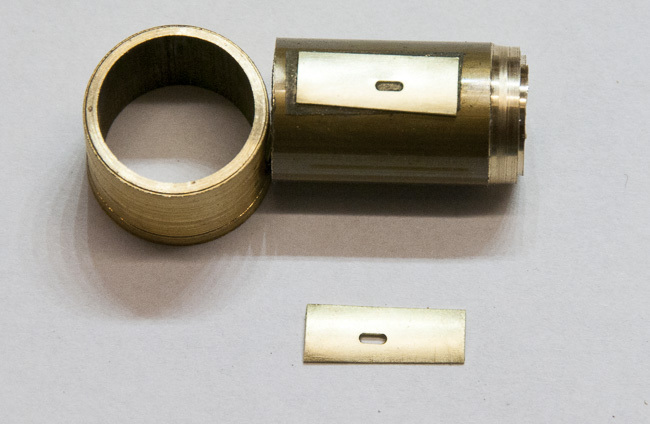 These parts were cut from 0.5 mm Phosphor bronze which happens to be the exact scale thickness. The other parts were cut in 0.37 mm double sided pcb material to allow easy soldering, the spring representation was cut from 0.25 mm brass. The resulting frame can thus be built as a split frame which allows pickup springs directly soldered to the frame sides. At some point in future some 3D printed metal wheels can probably be drawn up and sourced and then used with the same set-up for another model. Drawing of the main parts for a new frame. On the next frame the vertical longitudunal parts will be integrated directly onto the main sides as it doesn't bring much apart from a few mm material savings although this set-up is may be more prototypical. The only advantage that I found is that this set-up has the same width as the original FLM frame, which makes it easy to locate the original footplate in the correct position. 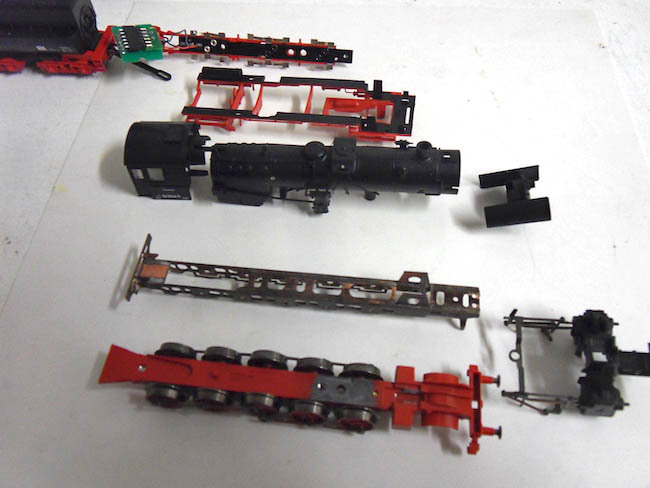 There are some further cross sections to draw but this requires an in depth look in what to recover from the FLM parts carrying the footplates and motion. The frame parts soldered together into a single unit. Frame blackened waiting for wheels. Besides the wheels as fiNe-scale versions several parts can be re-used depending on which version you are after. The easiest form is probably a type 26. Wheels need to be fiNe-scaled. The cylinders and smokebox door can be used after scraping off some superfluous parts, the cab can be cut up as the front half is OK for a type 25/26. The boiler needs a decision between new or modification. Scraping off tubes and making changes is probably more work than turning a new boiler and adding fresh parts directly to this. The footplate is probably a replacement job in metal sheet certainly if you want the slightly narrower profile above the slide bar of the Br 50 design. Frame with FLM wheels with new steel tyres, axles are still too long here. A first test with adapted wheels shows it to be rolling through the pointwork on Splitveld but one of the main drivers needed a new tyre. I used a new super glue but this is not entirely satisfactory, it sets too fast and doesn't leave any time for adjustment. One tyre didn't sit entirely true and I simply could not adjust it, thus this wheel ended up with quite a bit of wobble. Grinding the tyre off and produce a new one is the best remedy to repair this. Producing a new tyre using the dedicated tools is easy and the second time it was glued using epoxy to avoid the same problem. In the mean time a new boiler was turned from a piece of brass tubing with 10 mm inner diameter which is the same as the inner diameter of the FLM boiler. 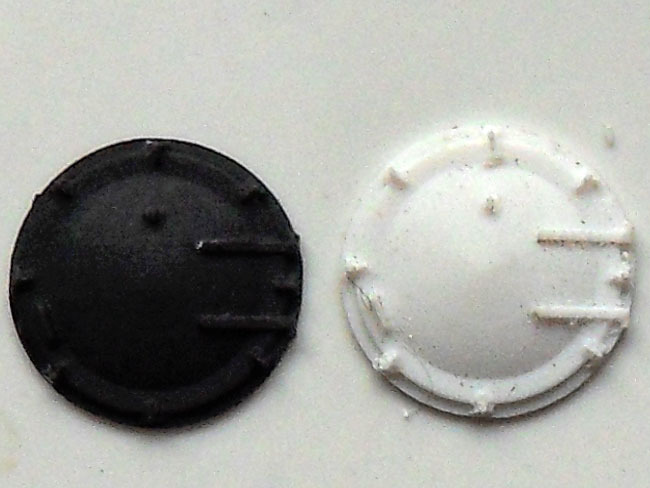 Also some new castings were made for the sandboxes and dome using a mould taken from a FLM BR50 made several years earlier. This picture shows how the mould was made with 2 component silicon rubber, according to the date this was in 2007.
progress photo during the milling of the firebox. The upper photo shows how the firebox was milled using a piece of longer material to fix it in the vice. The hollow base for the boiler was milled using a 12 mm end mill cutter, this is 0.25 mm oversize but I couldn't trace where I did put my small flycutter and didn't want to spend time on producing a new one. The second photo shows a test fit of the new type 25 boiler compared to the FLM type 26 boiler. Above we see the new firebox temporarily screwed to the boiler, this allowed to true up the back end in the lathe. This screw can later be used for fixing the boiler to the frame. Also this helps when soldering the firebox to the boiler so that this can be finished with wet and dry. With the firebox in position this allows to mark out the positions of all the other components and drill holes for the chimney and the covers for the washing plugs. The boiler still sits 1.25 mm too low because the drawing shows some support block of 200 mm height on top of the frame at the front of the firebox which is failing. On top of the boiler the castings for the dome and 2 sandboxes, still loose items. A new chimney was turned from a piece of 6 mm NS rod. First the curved base for the boiler was milled on the milling machine using the 12 mm end mill cutter. Then the rod was transferred to the lathe where it was drilled for 1 mm to be able to mount a pin for locating it in the hole on the boiler. After that the chimney was profiled to 3.6 mm for the chimney and 5.4 mm for the base and than cut off. 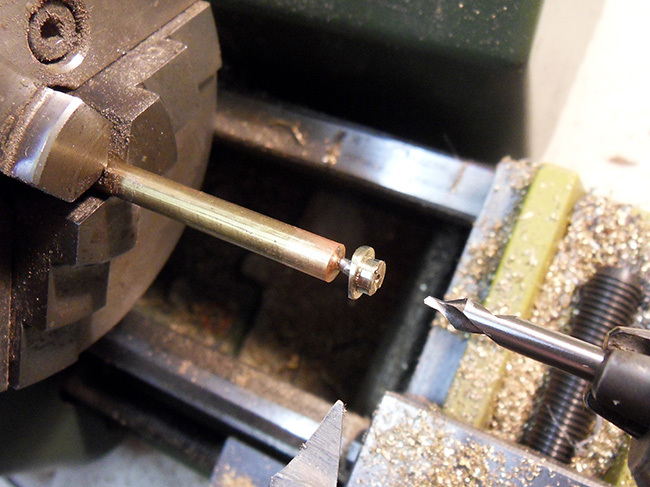 The photo shows it now soldered on another piece of brass of which the end was turned into a 1 mm pin. It is here center drilled for drilling out the inner core to 3.0 mm. After that it was soldered to the boiler using a torch and the shoulders were profiled using files. One of the next photo shows it sitting in place. Also at this stage the vertical lead in's for the steam pipes were opened out with a 1.5 mm milling cutter. 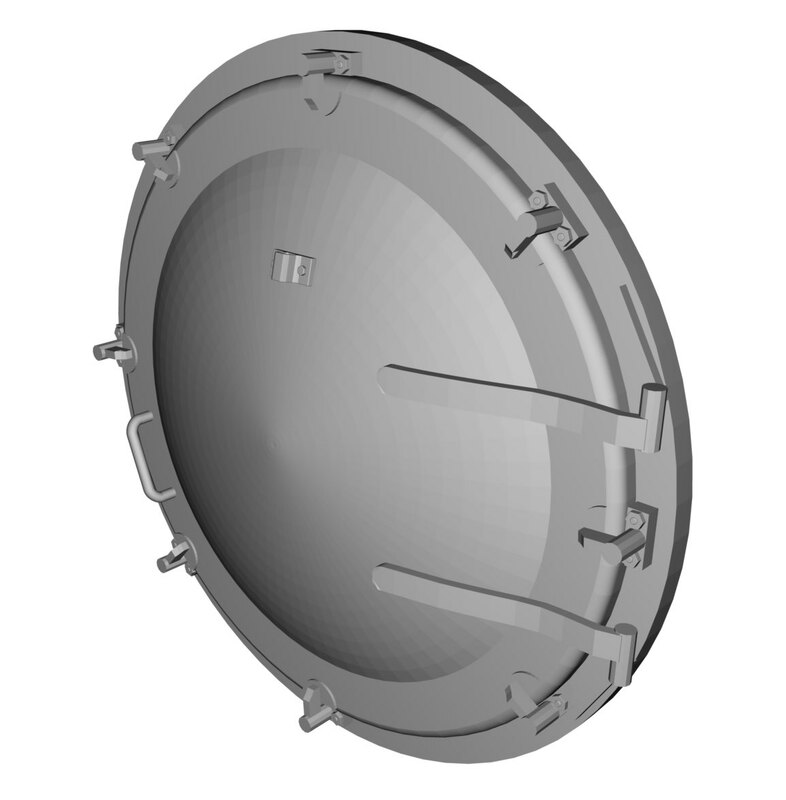 picture from the 3D STL file for a new smokebox door. Although the FLM door can be adapted I decided to draw up a new smokebox door as these are plain jobs done on the CNC mill. The type 25 door has longer hinges and it saves work to scrape off the German lamp and number plate, also the hand grip is missing. The base of this drawing is a Bezier profile swung through 360 degrees and than the hinges and other appendages such as the door locks are mounted. These parts were already available from the type 16 door. This pattern was milled on the milling machine in polystyrene. One of the next photo's shows an early variant held in place with some double sided tape, that one was suspiciously flat compared to the real thing. The adapted drawing above has the spherical section based on the drawing, which showed that its center lies on the cross of centerlines through chimney and boiler, sometimes it is smarter to take a look at the drawings first! a picture of two new smokebox doors, right hand directly from the machine and the left one brushed clean and painted black, note these are shown here about 7x larger than the real thing. This photo shows the work in progress on the left hand side of the boiler with the claddings for the various tubes in place and the flattish smokebox door taped on. The long parts of the cladding were made from 0.5 mm brass sheet with a small fold to follow the curve of the boiler. The rest is worked upon using files to sit them nicely on the boiler and they were soldered with the resistance soldering unit close to its highest setting of 250 W to get the heat in quickly in a small spot. The box that houses the 2 valves was shaped on the milling machine from a piece of 5 mm thick brass and again the 12 mm cutter was used for producing the curve to fit it to the boiler. Still missing is the large cover box where the tubes enter the cab, this has to wait until the footplate is fitted. The chimney now has a rim around the top and the covers over the washing plugs are mounted. These were turned on the lathe. With help of 2 pieces of PS the boiler sits here in on its normal position and close to riding height. With the raw operations on the boiler done we can look how we can combine boiler and frame. Obviously I filed a bit too much off the front seat but we can fit a sort of saddle on top of this with a fixing screw. The real thing has some sheet work with lots of bolts in this connection area. 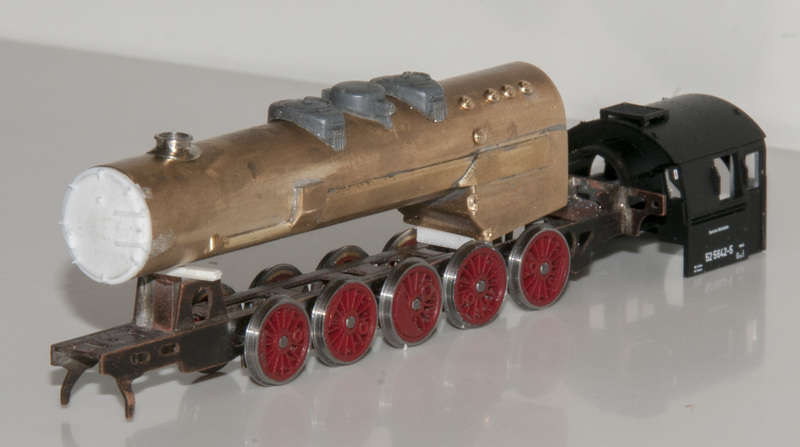 You can also note that a set of small gaps in the lower edge of the firebox are required to give the fourth driver some play to move up and down a bit. To enable to follow curves in the vertical plane/undulations in track the center driver has ± .25 mm vertical play and the 2nd and 4th driver each ±0.125 mm. Theoretically this allows at least 9 of the 10 (12 including bogie) wheels to have contact with the track, the front and back drivers are 'fixed'. The footplate fits the boiler with only minor surgery. The bits below the firebox in front of the cab can be simply cut off and below the cab the plastic spacers need to be opened out to allow for the wider frame. Some minor scraping off of the foot plate supports and than it sits nicely. The cab still needs some modification at the back end, but this mainly concerns cutting the back away. The boiler is screwed to the frame using one M1.4 screw through the front support and one M1.4 in the firebox. After a bit of careful filing of two small grooves in the front edge of the firebox all the wheels roll freely. With the boiler mounted we can finish the frame and start with mounting the cylinders, brakes and quarter the wheels and get all the rods and motion work on again. First steps are mounting the cylinders and brakes and do something about the front buffer beam. A picture with the cylinders pushed on. With reference to the drawings the width over the cylinders seems only 4 mm off, this is less than I expected based on the picture with the front view. Cutting 2 mm off on the inside of the cylinders is a quick job with a fretting saw. There is a big square space on the inside of the cylinders thus I soldered square blocks of 4.25 mm and 3.25 mm thick onto the frame. With the top of these blocks exactly level to the top of the frame the cylinders seem to ride on the correct height. Mounted like this the width over the cylinders is less than the width of the cab and close to the drawing, the setting of the cylinders can now be arranged depending on space necessary for the free running of pins in the rods on the first wheelsets. Also the out of scale steam tubes were cut off to be replaced by some round section later, the curvature in these is still a challenge to overcome. A picture with pony, wheels mounted with rods, the front step and cylinders all loosely added for good look. Quite some time is spend on all these fiddly details such as fitting a rotation point for the pony, pony frame and producing the square rods and front step, making all the pins for the rod shorter, fitting springs on the inside of the wheels, producing the buffers and fitting a buffer beam. For instance with a life split frame these metal rods will make a short over the boiler thus insulation is necessary. To make the lot more robust I decided to lead them into the boiler and fit a spacer in the boiler. Thus I made 2 2 mm openings in the boiler, these openings need now to be filled with some milliput or UHU glue and a slot filed to the width of these rods. The front step is made of 0.2 mm pcb material with insulation gaps and soldered to the 2 rods. These red hangers for the Walschaerts mechanism are now too far out and in touch with the cylinders. These hangers need to be replaced with those for a type 25 which need to sit 2 mm further inwards. One of the still failing items on the frame are the 2 air cylinders below the footplate somewhere halfway between 3rd and 4th driver. The pony wheels are temporary, these happened to sit in the box on my desk, they have the right spoke number and diameter but the rims are bit too skinny. Somehow already one of the brakes went missing. These are cut off from the FLM frame part and a hole drilled in the top and mounted on the pin. Inside the frame they can be glued together and to the frame with a piece of thin plastic. But as actually the front ones are missing on the FlM I drew up some spare parts which can be cut later on the milling machine. Studying photos and experience of building this frame allows to feed in several enhancements which allow easier building and some adaptations to get closer to the Belgian machines. 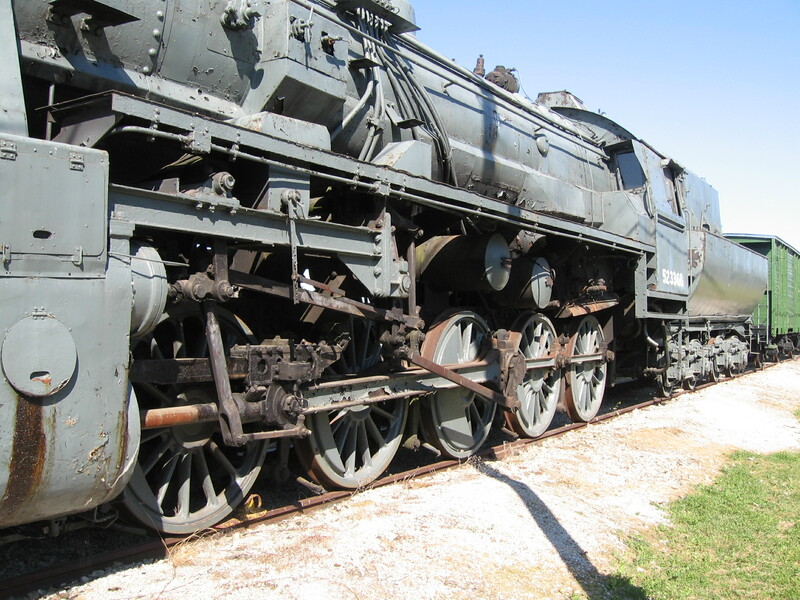 Such as at the front on the top of the frame seems fully closed except for the long oblong holes below the smokebox door. Also above the pony the later machines have 2 circular openings in the frame and a flatter wheel cover. A test fit for the new altered motion with new bars produced from brass profile. Didn't I warn in advance that sometimes a complete scratch built is less work than a conversion? Well in this case it is as there is more work on the desk. Like the type 81 rebuilts we probably will end up only using wheels, cylinders and part of the cab of the donor machine and some bits of the tender. With hindsight a Br 50 as donor for a type 25 might be a better choice because of the footplate and the motion work below it but mine was already reserved for building 25.001 or 25.013 with large smoke deflectors. Trying to fit the new (purely cosmetic) beam to carry the motion work showed that the second carrier for the footplate and the air pump on the right hand side do sit too far forward by at least 1 mm, it might be correct for a Br 52 but not for my machine. Also to get this metal work complete it is probably easier to fit this to the footplate. I first tried to solder it to the metal carrier of the motion itself but it will be difficult to pack it such that it rides at the correct height and be parallel to the footplate, there is only a single point to attach it to. Also the still missing outer part needs to be connected to this beam and soldering the lot together will require more luck than wisdom. New footplates are only strips some 3.5 mm wide but we probably need some sort of jig to solder the lot together and get everything square. First I have a look at the drawings again for the dimensions. Parts to cut for a new footplate and to connect the motion beams on, 0.37 mm double sided pcb board looks ideal for this job, easy to cut and can be soldered. The footplates are laminated with a piece of 0.1 mm NS sheet to create a nice thin line for the top of the footplate itself. This also will help in painting the red lining to set off its side against the black top. The lot is built together on a piece of scrap board, the footplates are spaced apart on a piece of double sided tape. The cross sections can than be mounted square using a small wood block. Here there is only a single piece still to go. Of course this footplate is not only pretty close to scale thickness but also much more rigid than the plastic FLM parts (0.2 mm thinner). This is how it looks on the loco, a bit of fiddling to create the joggle in the first footplate carrier is necessary to get everything back in the right position but we are close to the final look. footplate in the correct position and the steam pipes soldered in. The big picture is complete now, we can start detailing all those still missing parts such as the pipework on the boiler, hand rails etc. Some 18 wires fitted as pipe work and there are still plenty to go. If you look at the picture in original size it looks a smudgy job, smears and scratches everywhere, but that picture enlarges about a factor of 10. You can see there are 3 holes in the handwheels, but it is probably not worth going to such lengths, these hand wheels are less than 1.2 mm diameter and made on the lathe. The valve body was hand made from square wire filed down to 0.8 mm square before using a jewellers saw profiling the cuts and drilling sets of holes of 0.3 mm for the pipe work. These are 0.3 mm hard spring steel to keep them straight during the rest of the life time of the loco. The stanches are basically split pins made from 0.2 mm wire filed to a half flat and mounted in 'oversized' holes of 0.3 mm. This allows some fidlling to sit the wires parallel when the holes are filled with super glue. Also note the spear end on the steel wires making it easier to thread them through the holes. All these scratches and superfluous glue will disappear with a good blast with aluminioxide using a Badger sanding gun. That will leave a good key for the primer and a consecutive green base coat will hide everything to the bare eye. To finish this side there are some steps to do but currently I consider the pipe work acceptably complete taking the scarce useful photographic evidence in account. A turbo generator alias lighting machine was turned on the lathe. This is soldered to the boiler with 0.5 mm wire, the flat plate on which it is seated is a profiled piece of brass that fits the boiler rounding and has a 0.5 mm hole, it is simply clamped between the generator and boiler simulating a horizontal seat for the lighting machine. With 7 steps fitted this side of the boiler can be regarded as complete. It now undeniably looks like a type 25 even with all the work on the cab still to do. The opposite side of the boiler is still devoid of tubing but luckily that side is relative plain with only 2 hand rails and a set of tubes to connect the air pump. Progress on the right hand side. Of course it turns into a little more work as there is also the reach rod for the Walschaerts forward/backward movement. The handwheel on the casting was replaced and a whistle was turned. The air pump is now fitted to the footplate on a small bracket, which is how the real thing also sits. Also on the few photos that exist there is another pipe running vertically, but that is not on the drawings and it is unclear where it starts and where it ends, for the time being I decided to leave it off until I hit on a better photo. 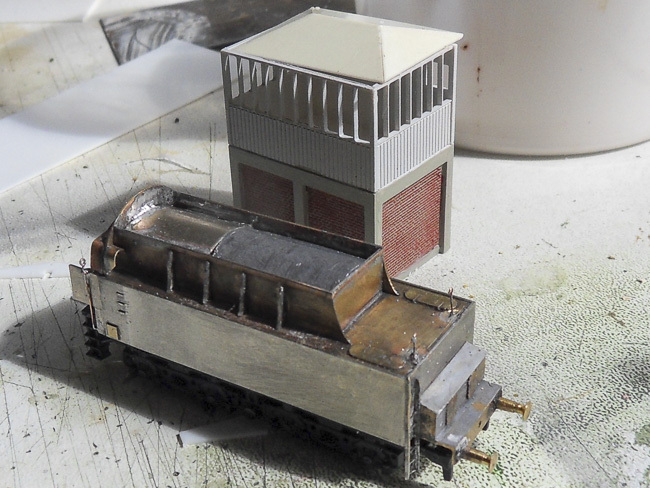 The boiler can be prepared for painting but the footplate still misses the vessel close to the cab. I can now give attention to the cab and the drawbar to see how this can be best connected to a tender and also decide which tender as there are still 2 options for that. prepared by grid blasting with aluminumoxide using the old Badger tool. Boiler was primed with red primer as the grey turned out to be no longer usable, cab is shortened, the windows are now modified to the rounded version of the Br50 with new shields from brass and some plastic inserts in the lower corners. I also fitted a new airvent filed from a piece of PS and closed the holes in the roof of the DR version and fitted a new floor to make it more rigid. The lettering was removed by sanding it off in order to prevent it shining through on its new coat of paint when viewed under oblique angles. Some minor things to do on the loco such as a coupling on the front and some hand grips and lamp irons on the buffer beam and the brake cylinders below the cab. The major work left to do is to modify the tender front which needs a windshield, steps and foot plate. PFT/TSP nicely produced an article in 'op de baan' magazine about these tenders with lots of photos, these will suffice to reconstruct the available bodies. The only nasty thing is that it needs to be made in 2 parts as there is a seperation between the bottom water tank and upper coal bunker. The above photos show it without the bunker part showing the original motor. This motor is rather big and driving the last 2 axles. Using an 8 mm Maxon we can put in a lot more weight for pulling power in the same space, but anyone can see that driving the front axles is a better solution as with extra weight the front axles will carry most of this weight. Unfortunately the frame is not symmetric thus we cannot turn it around. However I will first see how it performs before further changes are made. 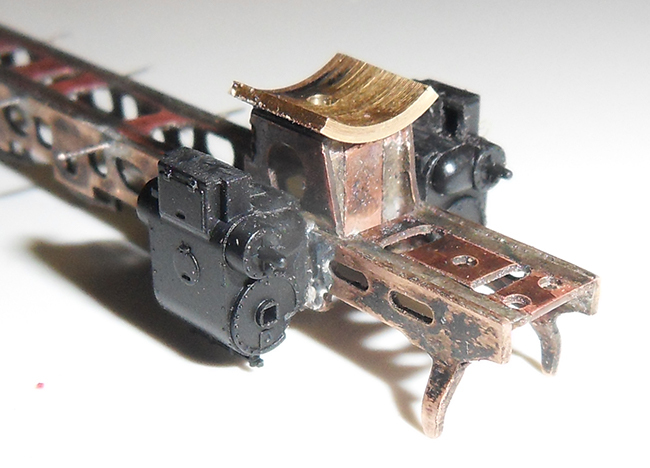 I started an attempt to build a new 26 m³ tender reusing parts from an earlier secondhand FLM Br50 model. The old FLM model doesn't have any value as it is much too long, even the main driving wheels are not worthwhile to convert and also the tender body is stretched on all sides to accomodate the older big FLM motor. However we can reuse the plastic replication of the tender bogie sides, which has the same shortcomings as that on the current model in that the wheelbase of the bogies is too short by 0.5 mm. Contrary to the current 32 m³ tender of the Br 52 both old and new 26 m³ tenders have all axles driven. The current model Br 50 26 m³ tender has a better design and there it is easy to replace the wormwheel with that of a smaller module with the same diameter such that you can end up with a gearing ratio of 1:32 in a matter of minutes. 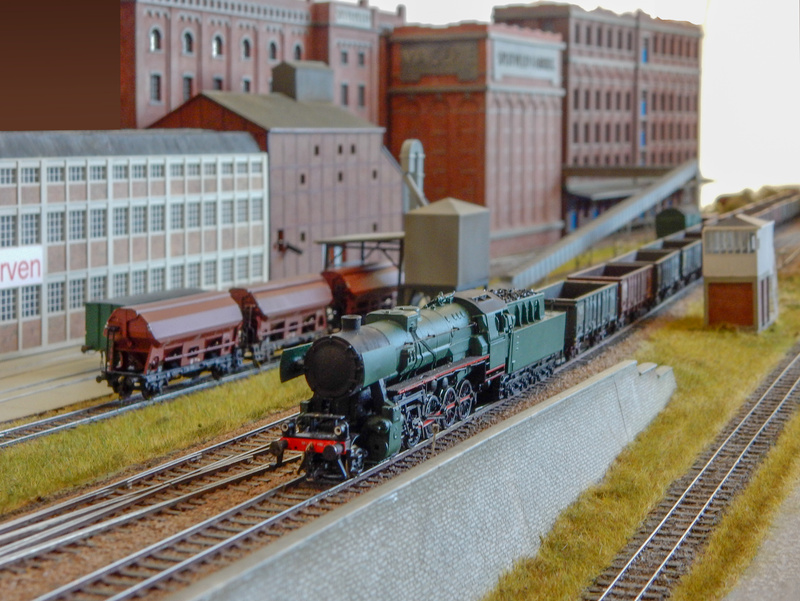 Using a better motor you than easily arrive at a much better performing loco. The old 26 m³ tender has a silly gearing with 2 reduction wheels driving a worm and the typical FLM symmetric double wormwheel solution with in this case 18 teeth in combination with 12 teeth gears on the axles. Thus effectively 1/3 of the reduction is destroyed in the last stage and the total reduction is 1:18 or thereabouts. Replacing half of this wormwheel with higher teeth numbers helps a bit but it still stays a silly construction. However the tender frame is actually a straight forward rectangular block of Zamak metal with some holes for the gear axles. Thus the better solution is to produce a new frame block from scratch using brass which will automatically be 20% heavier because of the higher material density. This approach also allows to mount the plastic part with the bogie sides much lower such that the buffers are on the correct height. On the original frame the plastic sits ~1 mm too high. Correcting this will make a lot of difference in visual appearance. 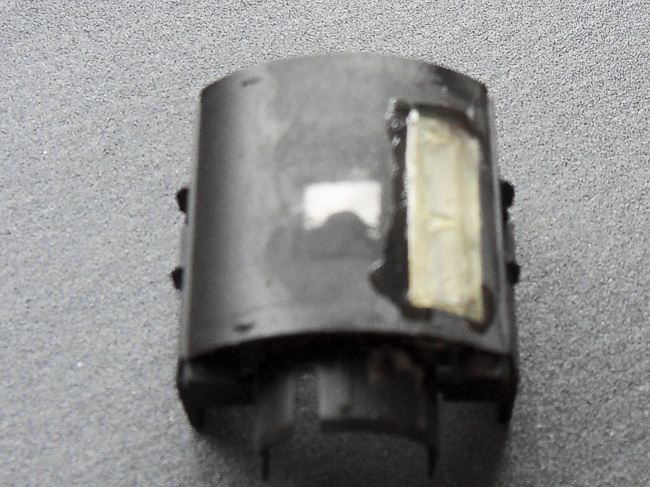 The plastic part has until now only its N-coupling cache carved off and a bit of material taken away above the wheels, this because when it rides on the correct height the flanges touch the plastic. FLM probably had a reason for it, but the wheels look to be oversize with 6.4 mm. Also all wheels had traction tyres which seems overdone to me. I replaced the center ones with home turned items from NS rod in order to be able to mount a set of pick up wipers later. The whole shebang is rolling when pushed with a finger, but a bit of fiddling is still necessary to get it more free rolling. Seen above is a 30 teeth M0.25 wormwheel coupled to a 12 teeth M0.4, with the same on the axles this results in a ratio of 30:1. 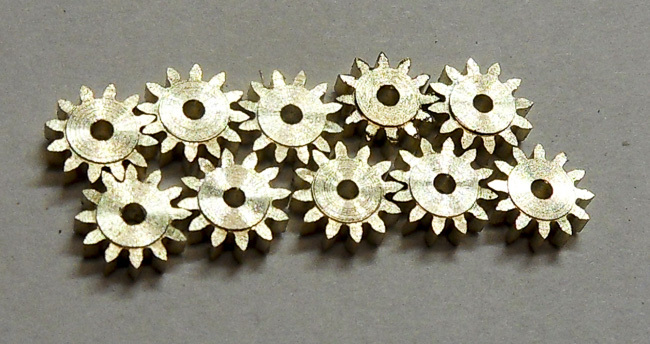 Replacing the wormwheel for a M0.2 with 36 or 40 teeth would allow to bring the ratio to 1:36 or 1:40 still fitting in the same pocket for the wormwheel. Using slightly larger blind gears would allow a correct wheelbase but than you also have to find a correct bogie presentation. On both tenders the FLM parts are slightly off using some average values. For the 32 m³ tender the bogie wheelbase would be correct but than the spacing between the two is too small. The chosen approach looks an acceptable compromise to me. Moving the gear wheels inward towards the center line would allow to use this drive concept for a 32 m³ tender as that plastic frame part needs a support between the bogies. However this was not possible with these wheels as the gears here are integral part of the insulated wheel center which leaves the 26 m³ tender as only option. In this set-up there is plenty of room to mount an 8 mm Maxon with flywheel and the rest of the space can be filled up with lead and still allow for correctly sized upper works. The alternative motor choice is a Maxon 1017 when more power (0.75W vs. 0.5W) is needed, but that is not likely. Motor fitted more permanently with a thin brass band soldered to the metal block which is screwed to the main frame and wipers added on the center wheels, ready for some test runs. Compared to the earlier photos you can see that all motor parts are shifted forward to get the body to sit correct, this required a new gear block and shift of the wormwheel pocket. Actually designing the tender using CAD instead of makeshift work would have prevented this. The motor still has about 3 mm space at the front and can sit about 1 mm lower which would allow the worm to sit more centered above the wormwheel. It actually turns out to run very nicely and the 30:1 gearing is OK for choice of speed and smoothness. Coupled to the loco this reveals the usual problem with FLM machines that the wheels stick at some point although they seem free running when pushed by hand, which is why I prefer a cardan drive mechanism that directly drives the main wheels. Look alike, a second tender was started using experience from the first one, but this time with home made components. Sort of copy and paste, but this time with 100% home built components to built a second tender. That is this time not only the metal block, but also the gears and wheels are home produced and this time with correct spacing between wheels! It has the same gearing, but instead of M0.25 in the first stage it uses a 30T M0.2 wormwheel and even smaller worm, which makes the motor sit lower. 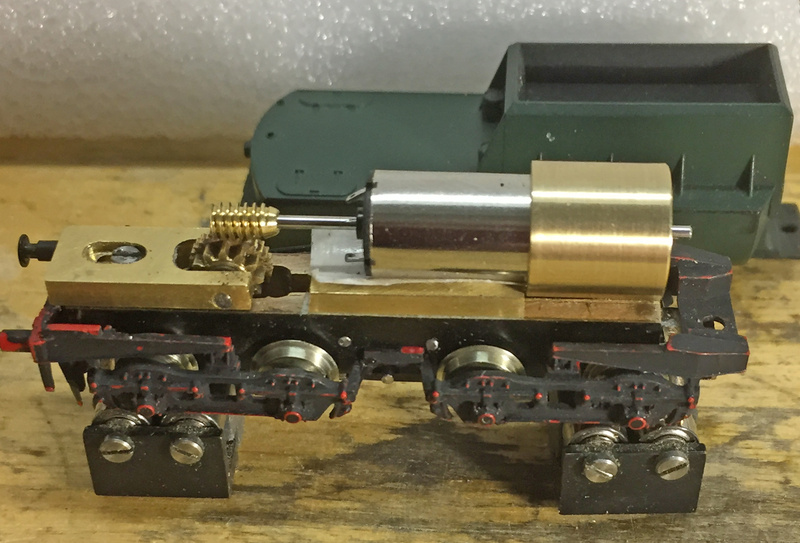 This is a 8mm Tramfabriek motor with double ends, comfortably long and probably slightly too long on the back but that will become clear when the cab is produced. The flywheel on this one has 11 mm cross section by 12 mm long. The plastic bogie presentation will be 3D printed and has correct dimensions and spacings for the axles. Some modifications need to be feed in to allow more space above the wheels, although on the printed prototype some carving with a minidrill will probably be quicker. New tender body from sheet metal with 3D printed bogie detail, this time there is probably enough space for an on board sound decoder. It brings also a bit more weight than the first one, showing 77g on the scales and that with the entire coal bunker still empty! The rest of the plastic of the old FLM tender is too long (2.5mm), too wide (0.7mm) and too high (1mm). The water tank of the new FLM tender is even higher but length and width are OK. It will be easier to fold a new box from brass sheet than modifying the existing plastic by cutting away what is too much and fixing the lot together again. Maybe it is worthwhile for saving some detailing work as the front part of the plastic can maybe stuck to the brass sheet, but in normal use that detail will be invisible when coupled to the loco. A rainy sunday afternoon (50 mm!) 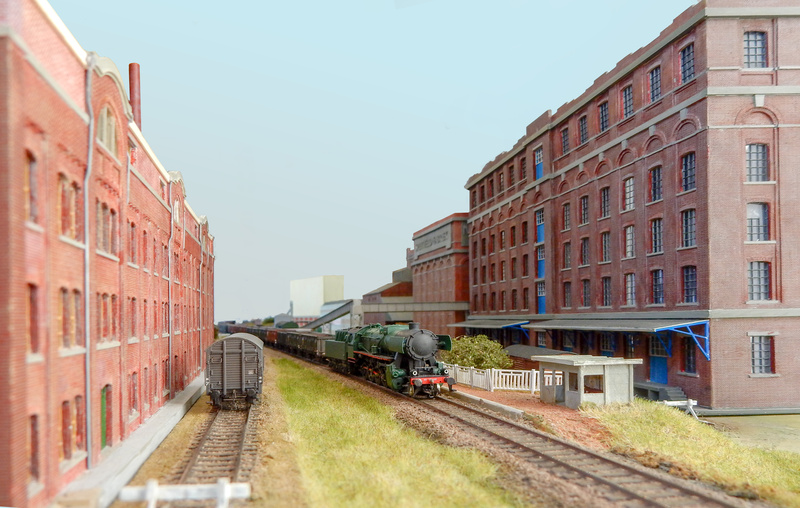 facilitated the construction of a correctly sized body from sheet metal, NS sheet of 0.37 mm for the water tank and 0.25 mm brass for the coal bunker and the front. The top of the water tank is now inline with the window edge, which is where it belongs. The original FLM tender rides much higher thus better not compare. 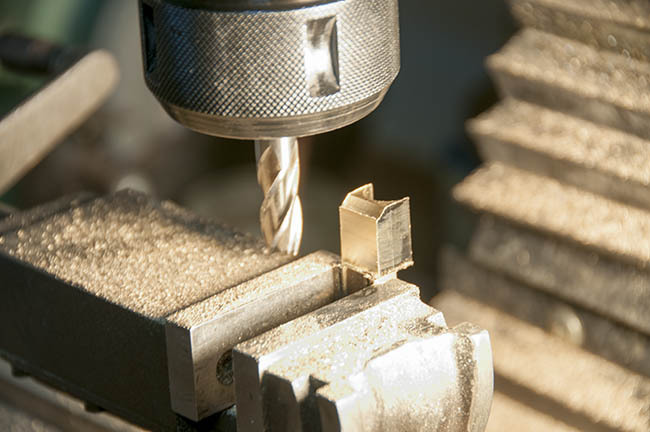 The construction is straight forward, it concerns mostly rectangular pieces of metal that can be quickly cut by hand with the quillotine cutter and/or fret saw. For the curved tender front with its window openings and the bunker stiffeners the machine tools pay off. Soldering was done with the resistance soldering unit. Studying the photo learns that the body needs to be shifted about 1 mm more forward because the space between the ladder and the body is too large. All detailing still needs to be done although that isn't that much work as it is a plain tender without any rivet detail. coupling and some handgrips are still to do. The whole thing as far finished as it will get, with lead mounted and topped up the thing now weighs some 68 g.
A gear train that fits the tender body of the 32 m³ tender. This design is based on a M0.2 worm driving a 30t wormwheel and M0.4 for the rest of the gears, basically a handful of 12t, 2x 16t and 1x10t gears. Motor will be the same type 8mm Maxon coreless with identical flywheel. This design can be produced as 2 parallel spaced bars with an intermediate space of 2 mm for the gears with an overal width of 7 mm. There is however not much space available for connecting the two bars into one single unit as the gears take up a lot of intermediate space. The gears are home produced using lathe and milling machine. Of course you can order these somewhere but they form a nice small exercise using the tools available. Basically I first produced a pre-sectioned rod of the correct diameter on the lathe, followed by cutting the teeth on the milling machine using the Vertex rotary table for indexing the teeth and than drilling and slicing the rod into individual gears on the lathe. The next three photos illustrate the process and the result. The gears are drilled 1 mm and have a small running face on both sides and will fit a 2 mm space. The same procedure was followed for the 16t gears only these received a 1.5 mm hole. The 10t was still available in my stock. On the above photo we see a test fit of the gear train on the 2.5 mm thick strip of brass that will become the frame. This looks to be promising although some finishing work is necesary to remove tiny burrs from the exit face. Of course, the alternative is to use the Proxxon minidrill to run them in using tootpaste as polishing medium. The holes were drilled on the milling machine. The large 3mm hole is on the photo is one of three used for fixing screws to keep it flat and fixed while drilling the holes. These sit outside the final frame part and will be lost during the shaping process of the frames to its final dimension. Test fit of the sketched construction using the new 8 mm double ended motor from Tramfabriek. Progress photo of the 32m3 tender ideas. This one has a set of new isolated FS160 wheels of NS without traction tyres. Still to do are mounting of pick-up springs and testing the running properties on track. Those on the rolling road are satisfying. 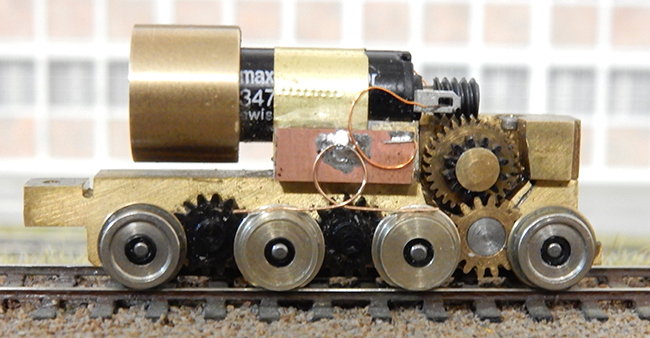 In this design the coal space above the motor is available for weight or a sound decoder + a bit less weight. This new motor with its long axles would also facilitate a simpler split axle construction driving only the outer 2 axles with traction tyres and 2 inner axles for pick-up and have an even lower profile. .. to be followed up ..
but not soon, something went wrong with soldering some additional parts to the fram by which a skew frame resulted, it still runs nicely though but it now no longer sits flat on track. Thus the whole lot has to be taken apart and soldered again straight. But as I am dissatisfied with the fixing of the plastic bogie presentation and the final weight doesn't look to be optimal either. Thus other options will be studied for this tender. Possibly the geared frame with cardan drive from the 32m3 tender is a better approach for such a combination. In order to get the type 25 running I started the built of a second 26m3 tender and maybe it should become twins. Collection of spare parts from this project, useful for a modernised DR version like 50.3666 and 50.3696 as seen on the top this page. Building a type 25/26 is now facilitated by FLM having brought out a french version which already has the frost protection covers on the boiler. This saves the major work on the boiler and only leaves the smaller modifications such as the failing deflection plates and cab and frame modification. On the end result we cannot see through the frame because the FLM wheels are not spidery enough, particularly the rims are too thick compared to the 1:1 example. Thus for a better presentation of the real thing we need to design and produce dedicated wheels. Using the FLM wheels it is therefore possible to take a big shortcut by modifying the FLM frame by replacing the top part with the wipers instead of constructing an entire new bar frame. 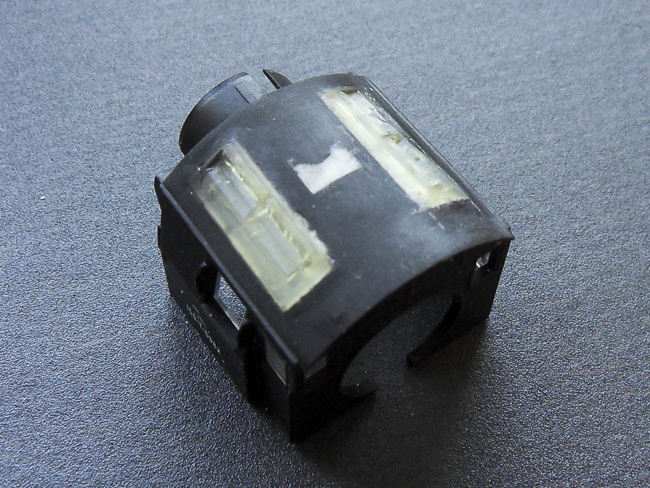 Leaving that plastic part off gives about 0.8 mm space for a set of non-visible wipers on top of the frame and allows to reuse the lower part with the springs and brakes. The part of the sheet frame above the pony can simply be grinded off which would make the plastic spring representation visible, the resulting frame will have the correct height for a bar frame but does not have all these holes of course. On the bar frame those springs sit below the frame thus all plastic parts can be cut off leaving a flat top. Going this way it will become more a conversion than a scratch built. Taking advantage of the fact that with the original FLM wheels you cannot see through the frame anyway this would also allow an entirely different approach using a tender drive with cardan. A gearing based upon M0.2 1:40 driving the 3 and/or 4th axle hidden by the double boilers and the firebox would allow a sufficient unvisible drive of the main frame. 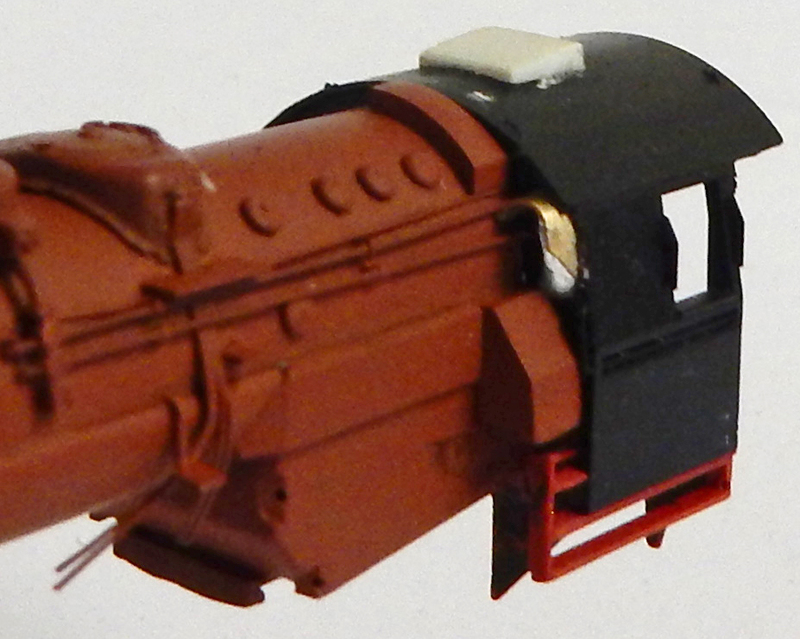 Filling the 10 mm inner core of the boiler with lead would than result in a loco that pulls the stars from heaven. With the above FLM spare frame available this looks a nice option for some experiments before tackling a type 26, a viable alternative to avoid building new motorised tenders. Ideas about a geared version leads to above frame. Some holes in the frame have disappeared to make place for extra axles with gears. The 3 center axles are fitted with 15T M0.4 coupled over 12T M0.4 and driven by a 30T M0.2 with a 2.8 mm worm in a mini gearbox, giving an overal ratio of 37.5:1. Alternative is a 36T wormwheel giving 1:45 but that will be 0.6 mm higher. It is all experimental and has not seen any running yet. It is not a splitaxle frame, the frame plates are connected by some pieces of 2mm brass to make it more rigid and it also gained a bit of weight. But it requires a rebuilt of the firebox to make space for the drive shaft or some alternative fitting of the motor in the boiler. 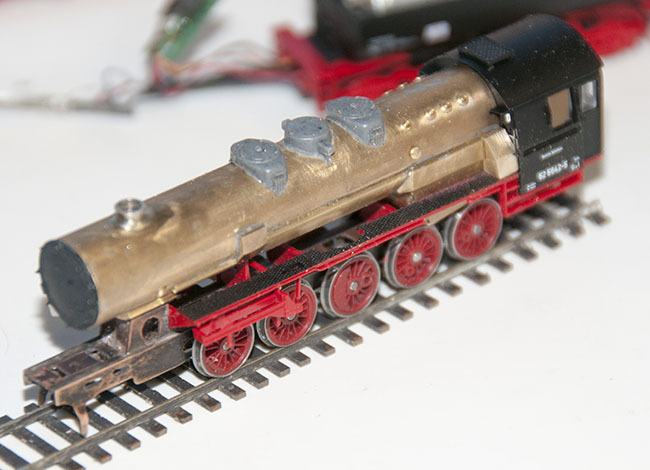 Both paths need changes to boiler and firebox which are not easy to do on a finished model thus maybe it is smart to built a boiler blank first just for testing, afterall this is only a piece of tube with a brass block soldered on. In the mean time I put my hand to a conversion of the french version 150 Y which is now running using original FLM frame parts. Still not a plain conversion: 12 new wheels, the cylinders set inward by cutting off 1.5 mm on the inside with a fret saw, the motion brackets cut off with a scalpel and glued further inwards to the footplate with superglue, steampipes narrowed by filing and set steeper. But most of the time was involved with getting the rods running forward as well as backward, this took ages and replacement of the internal weight by lead to create more friction was necessary. But its running now but it doesn't negotiate all curves on Splitveld as 80cm seems just below its minimum due to reducing the excessive side play in the axles. Not a problem as these loco's saw primarily mainline use in heavy traffic hauling and it can probably be solved by removing one of the washers that limit the play on the last axle. But not on this machine as I am certainly not waiting on having to go through another lengthy quartering procedure. A short video showing the running of the french version converted to fiNe-scale albeit without any attempt to produce a Belgian version. It is running on its original motor and considering the minimum speed and quality of running a replacement of the motor by a Maxon is not obligatory, certainly not when it will be used for main line duties only. When you need more pulling capacity than a new tender construction with more weight is the way to go. Or just do another one for double traction. A set of wind deflector plates were produced from 0.25 mm brass sheet. The curve in these items is produced by tacking them with double sided tape onto a suitably curved piece of rod with the top of the deflector aligned parallel to the axis. You need handed items thus check that you put the second one the right way up on to the block. The rod is clamped in a vice with the ring around it and then the ring is used for gently tapping the curve into the brass until it lies flat over the rod. The hole in the deflector plate will be used for fixing and aligning them on a piece of 3.5 x 1 mm brass bar that will fit into a horizontal slot cut into the boiler. This is slavishly copying the FLM method but the prototypical way of fixing them with 4 wires on the corners will be far too prone to damage. Forces don't scale and the model deflectors will be subjected to much higher forces than the real things. The idea is simple but aligning the 3 parts in 3 planes turns out to be not so easy. A much simpler solution is thus to make a partial cut in the beam and set them parallel using pliers by distorting the beam. This may require a slightly larger opening in the boiler but these openings are hidden behind the deflectors and thus are not visible. A replacement item from FLM can probably obtained as well, but note that at least the DR version has a different profile. mounting new vents in holes cut into the roof. Cutting holes in the cab roof for the new ventilation openings. This required making a rubber mould from the FLM Br 50 roof and casting a copy of that. Similar procedure to the boiler fittings above. The vents were cut out of the cast item and then mounted 1 by 1 into the roof. Difficulty is of course getting them parallel and at the same height. Theoretically you can cut the holes in the cab first and than fit the cab into the mould and cast them directly in place but the roofs are a tiny bit different in length and the plastic window insert are also different. Thus it doesn't fit nicely. The original vent was cut off and the hole was filled with super glue with filler. The interior glazing helps to position the new vents, they won't fall through and it will give some extra rigidity. Also the glass contains the pockets for fitting the cab to the firebox thus you cannot cut that away. The openings were cut with a mini drill using a new thin metal saw blade and then opened out with a scalpel. The things are then superglued in place and all cuts are filled and sanded to a smooth surface using some 400 wet and dry. The FLM plastic is pretty soft but seems to glue well. After the new vents were placed the cab was opened out at the back and the doors were cut out. It now starts to look like a model of a real type 26. Above a progress photo with the major changes done. On the To do list are at least a change of the hand rail for a straight metal one and a new green coat. Another step and again a bit closer to goal, the colour came out a bit light but at least its not glossy this time, but this can be corrected with some transparent darkened lacquer plus a dedicated weathering. On the above photo's you see the combination of the rebuilt Y150 with the new homebuilt 26 m³ tender but using the original drawbar. That drawbar needs to be shortened by 1.5 mm to let the tender ride closer to the cab. Some blackening on the tender frame to get rid of that brass colour below the cab cannot do harm either. The front still needs to be cleared from superfluous lamps and the too high frame parts and needs mounting of the 2 boiler struts with their steps. When the paint is dry I will fit a set of MFK couplings and then it can be tested on the next Fremo meeting. Of course this trial turned out to be pretty well succesful thus now we can finish this machine by modifying the front and give attention to further minor details. Looking fine on Splitveld Fabriek with new handrails on this side. 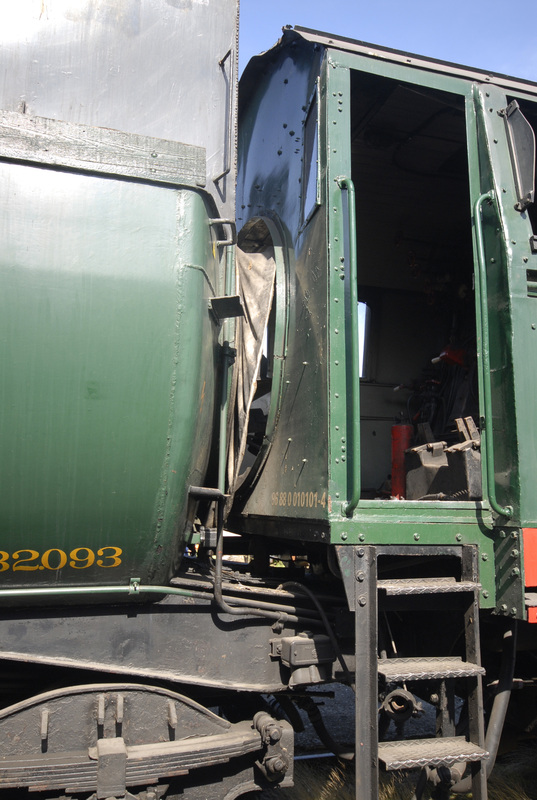 Here the hole in the footplate is filled, so it runs straight from front to cab.